Born on 25 May 1891 in Yorkshire, England - husband of May Catherine Hefford (later Granger), Dutton, Ontario - son of Hannah E. Hefford, London, England - at the time of his enlistment in 1916: present address same as wife, trade as tinsmith, married with two children, no current or previous military service, Church of England, height of 5 feet 5.5 inches, fair complexion, grey eyes, light brown hair. 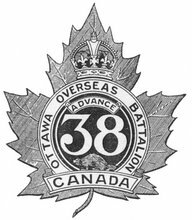 Joined the 91st Battalion, CEF, in St. Thomas, Ontario, on 16 February 1916 (number 189987) - taken on the strength of the 38th Battalion, CEF, on 20 or 21 August 1916 - killed in action on 9 April 1917 - name inscribed on the Vimy Memorial, France. (Updated with a photo of Pte Hefford's inscription on the Vimy Memorial that I took in August 2012). His name is inscribed on an honour roll in Dutton Memorial Hall. I see that the name on the Vimy Memorial is spelled Heffrod. I'm sure they'll be right out and re-carve that.